Here Comes Santa Claus !!! This photo was taken for Christmas 2008. 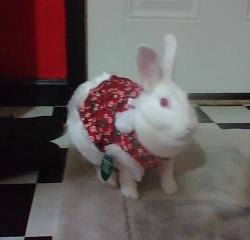 Actually, the outfit is a dogs costume, it was so cute, I bought the costume for her, to wear for Christmas that year. Bugsy, a rabbit Santa Claus for all the rabbits out there. I bought Bugsy, on Aug 5, 2008. She is an albino, New Zealand white rabbit. I bought her in a pet store at a mall close by. I went in to look at all the pets, there she was, sitting in a corner with 2 other rabbits. I wanted a girl, I went up to the desk and requested to find out if this lil white rabbit was a girl. She told me yes, and I bought her. She was 6-8 weeks old when I bought her home. She is a lovely rabbit. Our favorite thing together is to cuddle on the couch, just me and her. I talk to her, sing to her, and she loves it. We also do the "Bunny Hop" together. So when we do this cuddling, we start around 9PM, and she lays with me until I get up to go to work. She lays there with me, several times while holding her, she gives me wet, hot kisses, over and over again. She just loves to be held while laying down. She has her favorites, she loves toys, and she loves snacks that I give her, for her hairballs. She is one happy rabbit. I let her out times during the day, for her to drop her "binkies". I cannot see how my life will be without her. We are very close. I always tell her, I am going to have her for a very long time. She will become the longest living rabbit in the world. We made her, me and my husband, made her a condo with 2 floors, made out of metal cubes. She has a lot of room to run around. Now getting back with Here Comes Santa Claus, a Santa Claus for all the rabbits out there. She has a lot of love to give, and she will make your bunny as though they are part of the elves with her. Bugsy is ready for Christmas, are you? ?